Sold. Not so much because I enjoyed The Hunger Games (although I did, very much), but because this came from Maggie! When Maggie speaks, I sit up and request books. In the future we're so good at health and safety we're living forever and so the place is getting pretty overpopulated. Solution? Culling numbers...or in other words, there must be those who "glean." 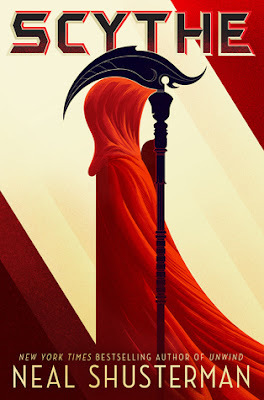 Scythe's world boasts the two things I liked about Unwind -- originality and ambition. I've never read anything quite like it, and the broad scope of its utopia has been on my mind plenty since. This is the kind of future you'll want to talk about with a friend while you're reading. I've already hijacked my book club into reading it next because I need to discusssss. Ethical questions abound, but what makes them so interesting, is that I'd never asked myself any of them...and I'm still not sure I can fully answer them. I was rattled by how warped my moral compass would seem at face value if I stated some of the acts and behaviours I was okay with in the world of Scythe, out of context. Unlike the concept of "unwinding," I bought into this proposition big-time and it made for trippy reading. I'm looking forward to more from Shusterman. I think there's still some room for growth in terms of narrative pacing, exploration of grey areas, and romantic chemistry, but I found the world and its rules compelling enough to keep reading. If you enjoyed The Hunger Games and any Scott Westerfield (particularly Uglies), this is for you. It also shares some tonal and thematic elements with 1984 and The Giver. It is the beginning of a series (and it's been optioned for film)...and I'll be following along. P.S. Isn't the cover clever!? Look closely.